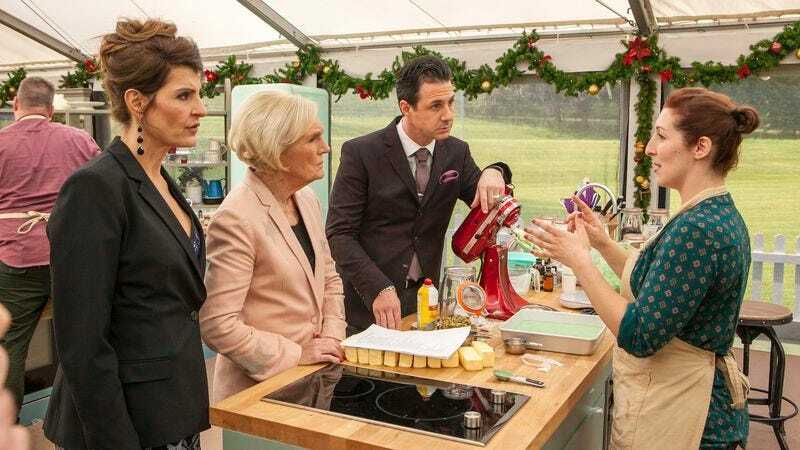 After spending its first week in the shadow of the British series on which it’s based, “Cake Week” gives ABC’s holiday rendition of the format a chance to shape its own identity. And given that the competition format itself is more or less The Great British Bake-Off, its identity will come from the bakers themselves. This happens in a variety of ways. For expositional purposes, the second episode repeats many of the same backstories that we saw in last week’s premiere, with shots of the bakers at home with family and friends. These are ultimately thin, especially if you were paying attention: we get it, Eddie has a grandmother and Ainslie is from California! There comes a point where you want the bakers’ identities to come through in more organic ways. In the Bake-Off format, this comes through in the bakes. It has become clear that the bakers are given very clear prompts to represent themselves through their baking—this is true in the British version as well, but it feels particularly prominent here, as though the shorter time span has the producers worried the bakers won’t be able to articulate what makes them distinct otherwise. Just look at Ainslie, who follows up a beach gingerbread house with a driftwood Yule Log in the Signature challenge—it’s a strong effort, which wins over Johnny and Mary, but it also serves as a way of marking her coastal identity. Such explicit symbolism is part of the format, but it runs the risk of overdoing it, and by limiting the ability for the bakers to articulate their baking identity as opposed to necessarily their personality or geographical location. That comes through in more subtle ways, like Eddie’s ambitious flavors, or Lauren’s technical precision, or Nicole’s insistence on staying true to her southern roots even when Johnny gives her weird looks for her pumpkin spice sponge. These aren’t as “relatable” to a more general audience, but they are more productive in generating interest in what the bakers are going to create, rather than a more basic set of facts or details about their lives. We’re getting a better sense of their baking skills two weeks in. The Yule Log Signature challenge offers a nice mix of creativity and technical precision, with the Swiss roll structure and the balance of crème and sponge—basically a cake without butter, as far as I understand it?—helping to offer clear differentiation. The same goes for the technical challenge, where Ainslie continued her strong performance by having some good instincts when it came to Johnny’s Tiramisu Cake that required special attention to the preparation of the lady fingers and the construction of layers. By the time we got to the Showstopper, I felt like I had a clear grasp on each baker’s approach to the competition, something that was missing last week when we only had such a small sample size. The “12 Days of Christmas” Fruitcake Showstopper is well-designed, although it might have been more fun if we had seen more of the different days represented rather than just four (with both Nicole and Tim picking “Partridge in a Pear Tree”). The challenge was particularly productive for Tim, who got to at least try to live up to his claim of being an “avant garde” baker earlier in the episode. Although I raise my eyebrow at that particular self-description, his interpretation of Partridge in a Pear Tree offers legitimate innovation, educating Mary—and me—on the “Naked Cake” trend while also displaying a “drop-in” baking method for his fruit that Mary had never seen before. It’s innovation that pays off—while he was too far back going into the Showstopper to win Star Baker, and Mary wasn’t entirely sold on this whole “naked” idea, he seemed to shine the most in the final bake, which will help as he tries to move forward. The battle for Star Baker is somewhat less interesting, if only because Ainslie drops the ball so significantly in the Showstopper. Baking in such a frantic environment is not something people typically experience, and given that Ainslie had no time to build up to this particular challenge like you would in a traditional 12-baker season, it’s not shocking that she would panic as her decorations were taking too long. Where she struggled—and this is a common Bake-Off problem—is in failing to pull together a new plan using her existing decoration. Her cake was ultimately impressive, but it was also falling apart and unfinished, which creates some serious issues when it comes to competing with Lauren. 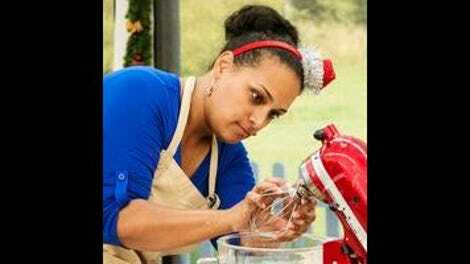 Although the judges remain fairly underwhelmed with Lauren’s flavors (#BoringButtercream), her finishing skills are impeccable, and unmatched by any of the other bakers—it seems difficult to imagine a situation where any baker will challenge her, at least as long as her bakes stay solid and everyone else ends up making mistakes. This is what ultimately leads to Eddie’s undoing, which is unfortunate in its way. I was hard on Eddie last week, as I would be hard on anyone who glues store-bought jujubes to a falling down gingerbread house, but he and Nicole are the two bakers whose personalities are really shining through as they bake. There’s a brief moment where the producers try to get a “fun” moment out of Ainslie and Tim taking a shot of booze, but it never registers as fully genuine. By comparison, Eddie and Nicole’s running dialogue of their baking makes for really charming television, resulting in some of the strongest banter with the judges and a nice sense of flow through the challenges. Just look at the moment where Lauren throws shade at the idea of using cookie cutters—Nicole is all over it, quipping about haters and bakers in a good-natured but also rightfully defensive fashion. She and Eddie also do some harmonizing on the Showstopper’s musical inspiration with Ian, together contributing almost all of the “festiveness” of this week’s baking procedure. But Eddie’s charming banter this week existed alongside a decidedly mediocre performance: his Yule Log was cracked with an uneven spiral, he forgot to cool his Tiramisu layers and lost all of his crème in the process, and his Showstopper was more pudding than fruitcake for Mary (even if Johnny seemed willing to look past it for his strong flavors). In the end, even booze couldn’t let Eddie enter into Mary’s heart, and so he—as expected after last week’s performance—heads home where his own grandmother and not Britain’s surrogate grandmother will be the judge of his bakes. As with last week, there was something very comforting about this outing: while the jumps to commercial—which I experienced in full this time—heightened the sense of drama, we still say the focus on technical skill be the primary driver of conflict, while we also saw some of the series’ trademark camaraderie as Nicole expresses sympathy for Ainslie as the latter pushed back tears as her Showstopper risked falling apart on her table. Ian and Nia are still trying a tad bit too hard at points, and Johnny is kind of neither here nor there with so little time to make a stronger impact, but there’s a general charm about the whole affair that’s only going to grow further as we get to know these contestants and their baking better. Last week Ian makes a soggy bottom joke about a cookie, and this week he nearly scares Mary Berry to death with his Five Lords A-Leaping? Mary must give him so much side-eye behind the scenes, y’all. Lauren, I think your decorations are lovely, but the literalness with which you chose to articulate the Frenchness of your hens—miniature Eiffel Towers—is not okay. Not. Okay. When you know that this show isn’t being filmed with the same type of real time production as the British series—which films on weekends—the bakers talking about “last week” is as confusing as it is on all American reality shows that film over a short period and pretend things are happening a week apart because the relativity of time is too confusing for your average viewer. Nicole’s use of canned pears was an interesting mini-narrative, but she articulated her reasoning well, and the judges concurred it worked out, so that’s a nice little victory for her as the judges continue to question some of her choices. “I guess logs crack, right?”—Eddie makes a good point here. In terms of verisimilitude of decoration, a cracked Yule Log is actually more realistic. But something tells me Mary wasn’t going to buy that argument. Like Tim, I’ve never seen a Partridge before, so make that fondant into whatever you want, friend. If you’re interested in trying out any of the recipes from the show, ABC has been putting them on their website—you can find the recipes page here. If I get ambitious over the weekend, I’ll try to make a Yule Log and report back. “You misspelled Christmas”—troll in the kitchen, Johnny. Troll in the kitchen.